Marcus is losing his touch. The TV newscaster’s ratings are down and his job is on the line. So when he’s given the opportunity to leave Las Vegas and search for Excalibur, the missing artifact from one of the greatest legends ever written, he jumps at the chance. It doesn’t hurt that the mafia also gave him an offer he couldn’t refuse. Violet’s psychic abilities serve as a gift and a curse. When the mafia’s marching orders force her onto a plane to England with Marcus, her skills are put to the test. As they probe the legend of King Arthur and Camelot, the unlikely team watches the body count start to rise. After their search takes them to the mist-shrouded Welsh countryside, Marcus and Violet begin putting the pieces together, but a surprise awaits. A surprise that could change their lives for good. If they survive to see it… Excalibur Rising is an edge-of-your-seat fantasy suspense novel laced with wit and history. 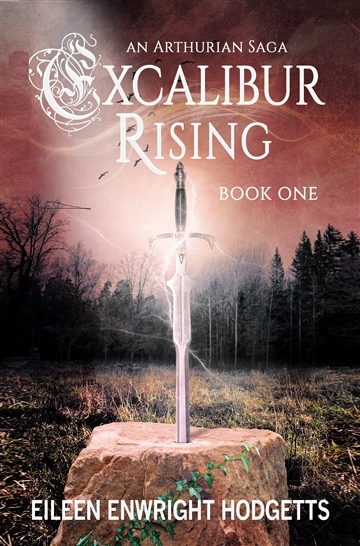 If you like funny characters, dramatic plot twists, and the myth of King Arthur, then you’ll love the first book in Eileen Enwright Hodgetts’ Excalibur Rising series. "This book grabbed my attention immediately and never let go. The story was fresh and creative and the character development was superb. This book was fun to read. Can't wait to read the others in the series." "As unbelievable as this story is, it actually explains a lot! Fabulous worlds, heroes and villains abound. I have to read the rest of this series ASAP." "Amazing tale, terrific explanation of Camelot! A really wonderful story with excellent character development. From the beginning to the end the legend and the characters draw you in. By the end you KNOW the people. I rarely buy books but this one is so good, I have to read more by this author and more in this saga. Lead on Lady Eileen! On to Camelot!"